Enigmatic French dance maestro Pascal Arbez, better known as Vitalic, has always mined a rich seam in audacious maximalism and a stylish, off-centre Eurodance. From the loopy eletro of his 2005 debut OK Cowboy to 2012's in-your-face Rave Age, he's blazed a trail through dancefloors and arenas while gathering no shortage of critical acclaim. The producer is starting 2017 with a bang, releasing new album Voyager and touring a brand new live show across Europe and beyond. 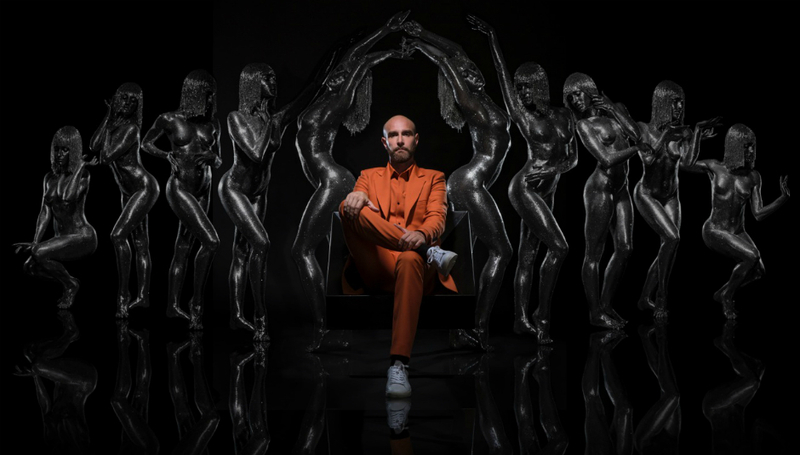 His fourth album in 15 years is inspired by the likes of Giorgio Moroder, Cerrone, and Patrick Cowley, and features collaborations with David Shaw And The Beat, Mark Kerr, and Miss Kittin. Arbez gave us the lowdown on all ten tracks ahead of its release this Friday (20 January). Starting an album with a short introduction is a bit old fashion now, but I still like the idea. This one is a short song intending to announce that the trip is starting. I thought that mixing a disco bass together with an obsessive ‘Mexican-ish’ gimmick was a funny way to start. It's kind of funny but weird at the same time. This is the last song I made for this L.P. A basic Moog-ish disco bass and new wave epic voices are my favourite references from 70's and 80's music. All the elements are out of tune. Nowadays, it’s very easy to make songs that sound totally neat and perfect; anybody can sing totally in tune with some processing. I go for the opposite, making errors when sequencing the drums or programming the sounds to be out of tune randomly. There are two different readings for this one. The voices can stand for a crowd cheering a DJ, or they stand for some kind of incantations from an aborigine tribe. To me, it’s the second option. Their incantations are an order to make you levitate. Hans is the driver of my night liner bus when I am on tour. He is both a driver and a philosopher. I wanted to dedicate a song to him for all the great moments we have on tour. I had the instrumental song and the title, but didn’t know who could really get the song and write the right thing. Miss Kittin wrote the lyrics in just a snap after some lunch in Paris. And that was it - my favourite song on the LP. I was just about to leave my flat to catch a flight when the whole song popped into my mind. I ran to the studio because the three elements are quite complex and I was afraid to lose them. I sent it to Garraud, who co-produced that one with me. A few days later we sent it to Mark Kerr, singer of the band Maestro, to give it that new wave colour. Some will see this song as a tribute to some funky blip 80's songs. The real idea behind that one was to create an acceleration effect you can experience in a theme park. I love this feeling of high-speed stargazing. It's not easy to share personal sensations other than love and sadness in music, but I try to. Initially, I wanted to call this one 'Le Paradis Des Chien' because I have a very strong connection with animals and particularly my dogs. I am not a piano player, so it took me ages to sequence the full orchestra melody note after note. I tried to find some opera singers to make that Klaus Nomi dramatic voice, but never succeeded. I finally made it with a computer voice myself. I find it both funny and rewarding to learn how to make things alone with just a computer or a machine. Nozomi means ‘wish’ and refers to the Japanese fast train, the fastest one I’ve experienced. It goes through the countryside, crossing cities one after the other without stopping or slowing down. The song refers to that poetic Japanese concept of having hopes and travelling. This is also a tribute to 'Warm Leatherette' by The Normal, a song I’m obsessed with and is still avant-garde in my eyes. 'Sweet Cigarette' sounds metallic and unstable because it made entirely with Buchla synthesisers and wasn't sequenced. I just played it with the keyboard and that makes the whole thing sound unstable somehow. The lyrics were written by an Icelandic-British friend of mine living in Paris, a community manager in a huge cosmetic brand by day, and a freak known as Blanche Poubelle by night. It’s a bit weird to finish your fourth album with a cover of Supertramp and I thought long and hard about it. Initially, I did it just for fun. It was a joke with Joachim Garraud. But little by little, the song was getting really intense and also very different from the original. So after much hesitation, I decided to put it on the LP and feel it’s the perfect goodbye song. Voyager by Vitalic is out on the 20 January via Citizen Records. For more information about the artist, including upcoming tour dates, please visit his official website.